Television producers were taken by surprise with the popularity of this observational documentary produced by independent film-makers Pacific Screen when it first screened on New Zealand’s TV2 in December 2014. The slightly longer version of the documentary made for international audiences can been seen here. This documentary and the second in the series, Gloriavale Life and Death, was recently awarded a silver medal at the 2016 New York Film Festival in the renowned World’s Best TV & Films competitions (community portrait category). New Zealand viewers can click here to see the local version and other clips at TVNZ OnDemand. For New Zealand viewers the 47-minute documentary produced by independent film-makers Pacific Screen is available at NZTV OnDemand here for all viewers. To read the testimony of Steady Standtrue, click here. Several other scenes related to Gloriavale: Life and Death can be found here. The third and final observational documentary about Gloriavale screened on New Zealand’s TV2 in the 7th Month of 2016. This time the ladies at Gloriavale spoke about their roles in the community as wives, mothers and helpers. The film closed with one of our wedding songs which has since been downloaded hundreds of thousands of times and made airtime on New Zealand radio. This is the international version. 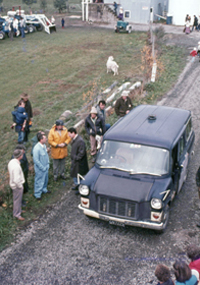 In 1982, the community which led to Gloriavale on the West Coast was the subject of an episode of “Country Calendar”, a popular television series on New Zealand topics of interest. Check it out here. to see how many of the foundation principles have not changed in 40 years. 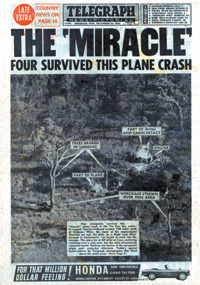 In 1967, the Queensland newspapers proclaimed a miracle had happened when a light plane crashed with four people on board – and everybody survived. The plane was piloted by the founder of the Gloriavale Christian Community while he was returning from mission work in North Queensland. A booklet about the event can be viewed or downloaded free of charge.